[mrgreen] Immortal Romance Slots has more to offer than the average slot machine. If you love a good exciting storyline as well as lots of chances to win, then you have found it. The storyline includes an 800 year old vampire named Troy, a Caribbean witch named Amber, Michael, a Transylvanian vampire, and Sarah, a medical researcher in love with Michael, and just discovering that she is more than a mere mortal. You can learn more about the Immortal Romance saga by clicking various links as you play. Another feature that sets this game apart is the ten original songs that captivates and add even more life to the storyline and characters. 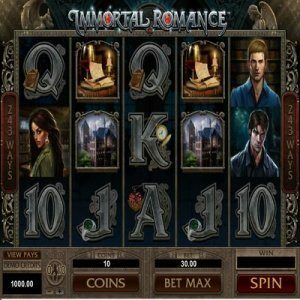 Immortal Romance is a Ways to Win slot that allows you 243 ways to win, more ways to win than any pay-line based slot. You win by matching symbols on the adjoining reels and you win regardless of whether the symbols are at the top, in the middle or at the bottom of the reel. Created by MicroGaming, one of the leading game developers in the industry, there are bonus games, free spins and special features you are sure to love. Plus, following the storyline is like reading a good book. The symbols are Vampire themed including a mansion, a female and male vampire, a witch, and a book of secrets. The game Logo is the wild symbol and poker symbols are also included in this video slot game. The Wild symbol acts as a multiplier that can substitute for any other symbol, and when it does and form a winning combination, your winnings double. The Golden Doorknob is the scatter symbol and three will trigger the bonus feature, The Chamber of Spin. The Chamber of Spins in Immortal Romance slots gives four progressive types of spins. The first time you trigger free spins you will visit Amber’s chamber and are rewarded 10 free spins which multiplies your winnings 5 times. After triggering free spins five times, you will visit Troy’s chamber and awarded 15 free spins. A vampire bat feature turns symbols into multiplier and wild symbols and your winnings are multiplied up to 6 times. After triggering free spins for the tenth time, you will enter Michael’s chamber and awarded 20 free spins on the Rolling Reels, earning a multiplier up to 5 times on all wins awarded for winning several spins in a row. After the 15th time triggering free spins, you will enter Sara’s chamber, awarded 25 free spins and a Wild Wine symbol that appears on the third reel, substitute for any other symbol and randomly turns any other symbols wild. The Wild Desire Feature is a randomly awarded event that will turn up to 5 reels wild with a really big payout. It can’t be triggered with the free spin feature. You win a jackpot if you spin 5 Immortal Romance logo symbols. Play Immortal Romance for a great exciting storyline and 243 ways to win.